As a result of more difficult trading conditions retailers profit margins have deteriorated in H2 of 2017, and further decline is expected in 2018. 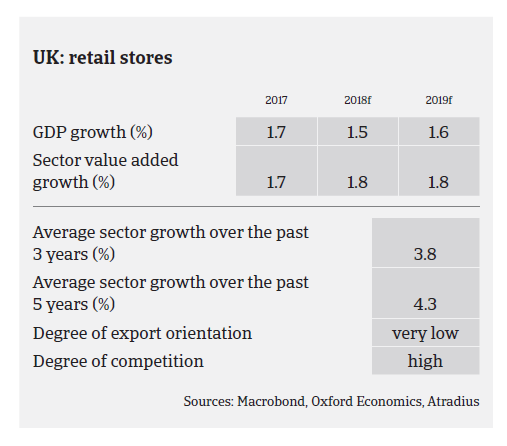 While consumer spending has been the engine of UK economic growth over the last couple of years, supported by higher employment and low inflation, the 2018 outlook for the British non-food retail sector is challenging. This is due to lower consumer confidence, decreasing household consumption (estimated to increase just 1%), higher consumer prices and higher unemployment, coupled with deteriorated real wages. The decline already started at the end of 2017 as, according to the BRC-KPMG retail sales monitor, in the period September-November 2017 (which includes Black Friday) non-food retail sales decreased 3.7% on a like-for-like basis, while November 2017-January 2018 sales declined 0.6%. Online sales, meanwhile accounting for approximately 15% of retail spending, grew at the expense of brick-and-mortar retailers during this period. However, with 7% online retail growth, was much lower than in previous years - a sign that even this previously fast-growing segment has been affected by the slowdown. Additionally, in January 2018 (traditionally a key part of the year for big ticket retailers) sales of furniture and household appliances were disappointing. As a result of more difficult trading conditions, it comes as no surprise that profit margins have deteriorated in H2 of 2017, and further decline is expected in 2018, mainly for brick-and-mortar retailers. In order to preserve margins many of the larger established traditional retailers are trying to offset the deterioration in their offline business by expanding their online channels. Payments in the consumer durables retail industry take 45-60 days on average. We have recorded a significant increase in non-payment notifications in H2 of 2017. We expect this deteriorating trend to continue in 2018, as the British retail market remains highly competitive while facing changing shopping behaviour (i.e. increasing price sensitivity and a growing share of online retail sales) and lower consumer spending. 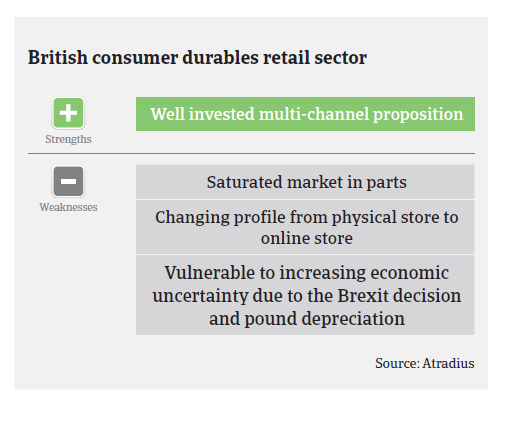 Additional issues are the weaker pound making purchases more expensive (this especially affects “big ticket” and furniture retailers) and minimum wage increases, leading to increased input costs for consumers in a highly competitive and shrinking market environment. Business insolvencies are expected to increase by about 5% in 2018 after already rising over the past six months. The industry is going through a period of correction, with businesses failing to adapt to online demand facing serious troubles. We currently maintain a neutral to restrictive approach to underwriting in the consumer durables segment. 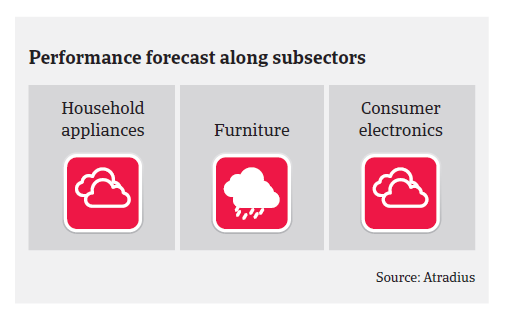 The household appliances sector is holding up reasonably well for the time being, but future deterioration cannot be ruled out. As large ticket items in the furniture segment face major sales decreases we observe that the largest players are struggling, while a number of smaller players already became insolvent. In the consumer electronics segment phone retail is a particularly troubled segment due to lack of innovation, longer lifespan of handsets, and a change in the legislation of EU roaming tariffs. We continue to monitor developments in the sector on a regular basis, making as much contact with buyers as possible; in particular with those who heavily rely on sourcing materials from overseas, those who have large store portfolios, high levels of debt to service and those whose financials are showing signs of deterioration. In general there is a willingness for retailers to share confidential financial information, allowing us to make the best informed decision. Brexit will undoubtedly impact on the construction market in the coming years, as the industry is very susceptible to shifts in investor confidence.